In a perfect world, my vacations would take place in idyllic locations such as Aruba, Italy, and New Zealand. I don’t live in a perfect world with a perfect bank account. But even on a budget, I found a way to enjoy the perfect weekend getaway — right in my own backyard. My husband and I took a drive down to Tucson, Arizona, and spent the weekend exploring some of our favorite southern Arizona destinations. We found an online deal for a Tucson bed and breakfast and took the risk, booking it sight unseen. I’m so glad we did! 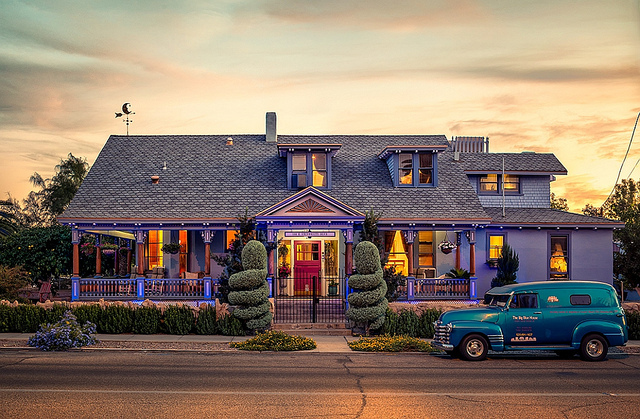 The Big Blue House Inn, located in Tucson, Arizona, offers comfort and charm. Photo courtesy of Big Blue House Inn. The Big Blue House Inn offered all I had hoped for in a bed and breakfast. Complete with wrap around porch and comfy rockers, it holds all the charm and relaxation of a Southern veranda. It was the perfect spot to enjoy a glass of wine, read, rock, and watch the world go by. From the charming fireplace and bay window reading nook to the comfortable bed and convenient kitchenette, our room offered the quiet respite we craved. We settled into leather reading chairs with a pile of magazines and books and relished the gift of doing nothing. We brewed coffee in the mornings and enjoyed coffee in bed while we planned our daily adventures. 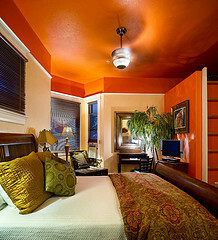 Featuring a cozy sitting area and luxurious bed, our room offered a quiet retreat. Photo courtesy of Big Blue House Inn. The mining town of Bisbee was tops on our list. Founded in 1880, Bisbee was home to one of the richest mineral sites in the world, producing millions of ounces of gold, copper, silver, lead, and zinc. Even today, the rich red hues of the surrounding hillsides offer a glimpse of the wealth they once produced. 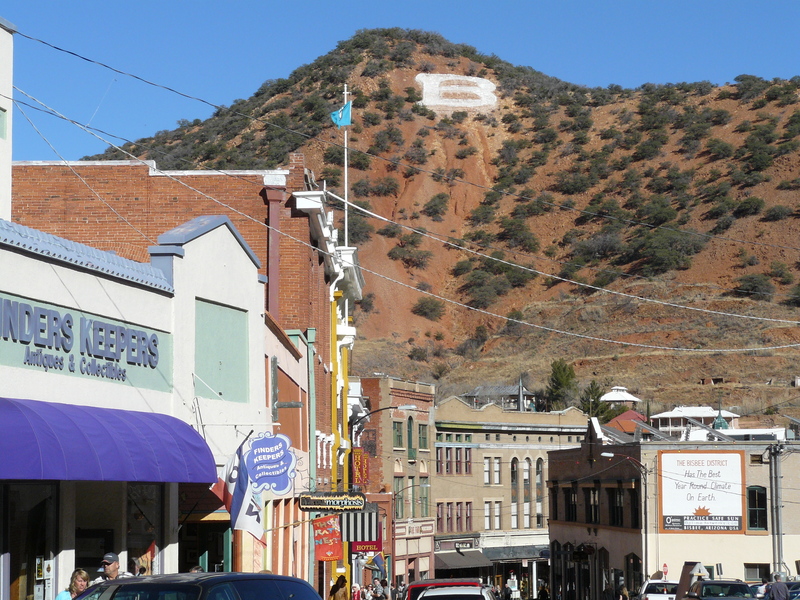 The main street in Bisbee, Arizona with its famous “B” hilltop in the background. Today, Bisbee is home to an array of artists, merchants, and restaurants. The charm of its original architecture and its eclectic atmosphere make it the perfect destination for dining, shopping, and exploration. 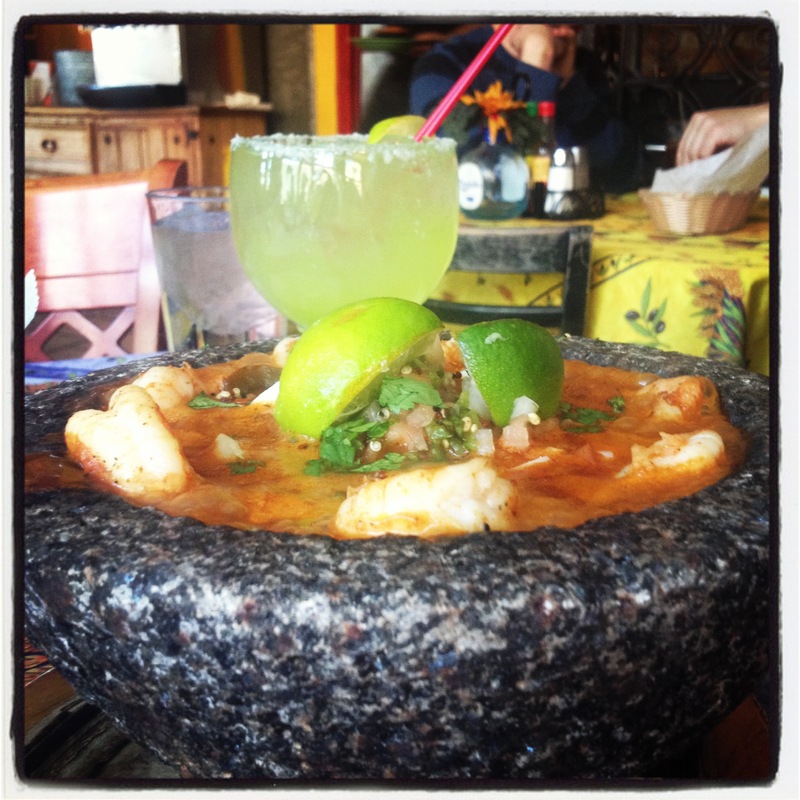 Santiago Restaurant offers decadent Mexican food and margaritas so large, you can almost swim in them! 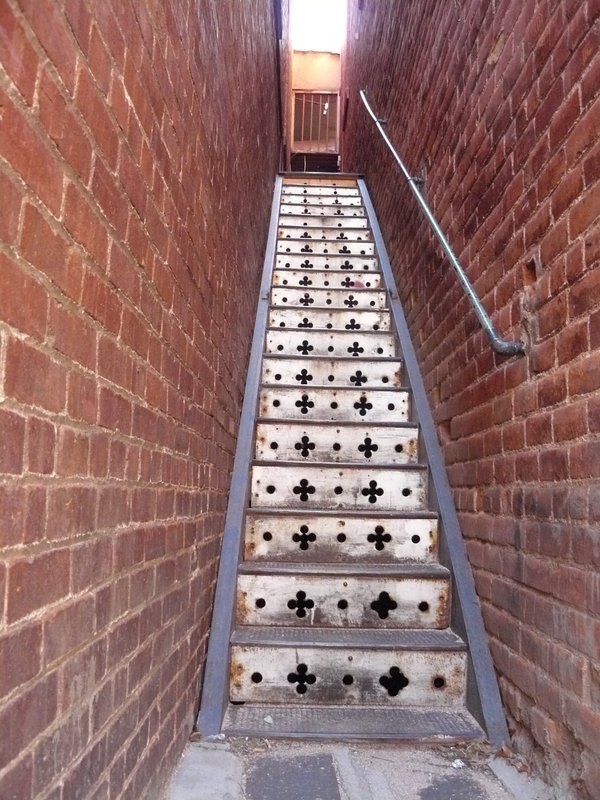 The alleys of Bisbee offer a glimpse of yesteryear charm. 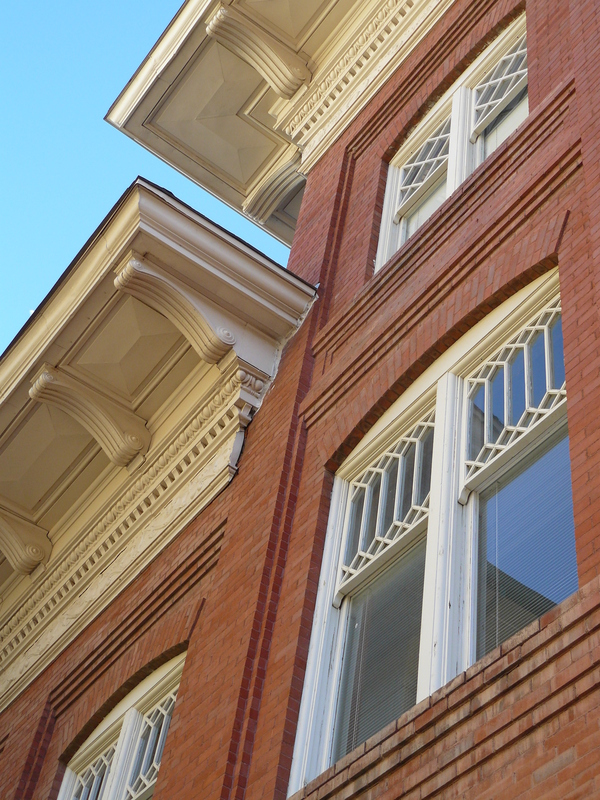 Bisbee offers an endless supply of architectural interest and a view into the town’s colorful past. Back in Tucson, we decided to wander the fun and funky 4th Avenue district. Located within walking distance of The Big Blue House Inn, it boasts restaurants, bars, shopping, coffee shops and street musicians, making it the perfect place to people watch. We enjoyed a fabulous dinner at the landmark restaurant, Caruso’s. This family-owned Italian restaurant has been in operation since the 1930s and features a lovely garden patio, complete with fountain and flowers. 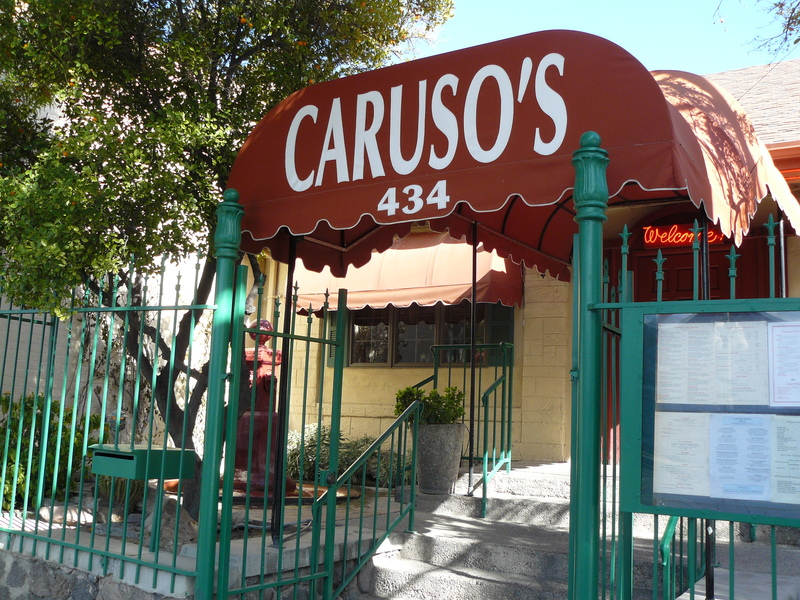 The canopied walkway of Caruso’s Restaurant in Tucson. Before returning home the next day, we decided to stop off at the Tucson Botanical Garden. Tucked into a quiet neighborhood, the garden offers unexpected charm at every turn. Although it features the obligatory cacti and desert brush one expects from an Arizona landscape, the Garden has incorporated local artistry and history that enriches the experience. 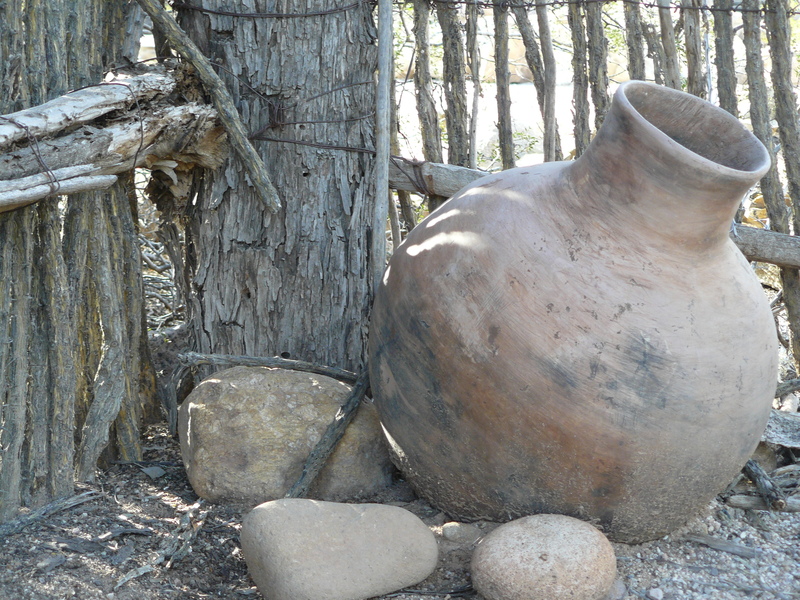 Pottery and other examples of indigenous life pay tribute to the Native American history of Tucson. 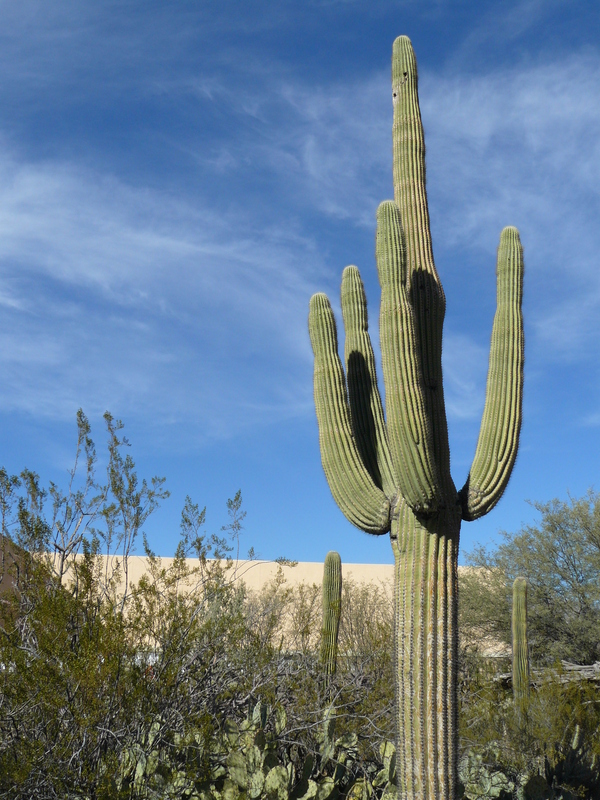 Quintessential Arizona is visible at every turn at the Tucson Botanical Garden. Tucked in between saguaros and mesquites are herb gardens that delight with the sights and scents of lavender, rosemary, sage, and other savory herbs. A neighborhood garden pays tribute to the local culture and artistry of the Tucson area. Featuring community-based planting beds and garden art, its pathways pay homage to the citizens of the city for which the garden is named. 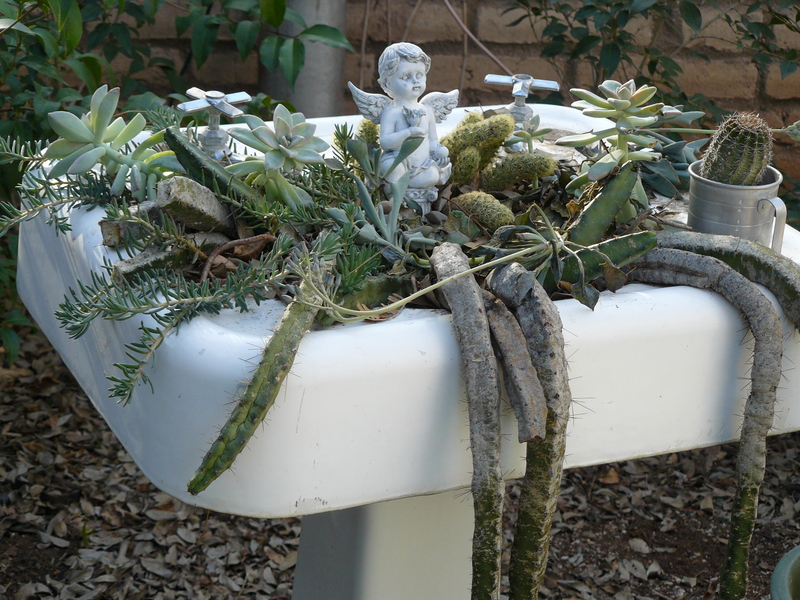 An old sink becomes a planting bed for succulents in a neighborhood garden. 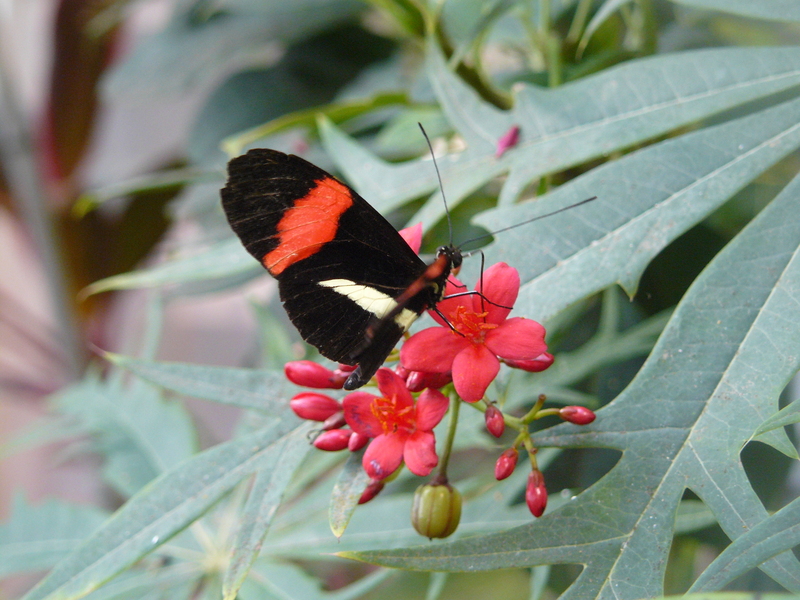 A butterfly stops to rest and feed at the Tucson Botanical Garden. Our weekend getaway to southern Arizona offered so much more than we bargained for. The sights, sounds, scents, and tastes of the trip were a delicious surprise — one we can’t wait to experience again. For the past few days, I’ve been doing a lot of listening. Congresswoman Gabby Giffords was nearly killed for doing exactly this so I thought it was the least I could do in the days following her attempted assassination and the massacre of six others. Since Saturday, I’ve kept my mouth shut and my ears opened. I’ve listened to family members remember our neighbors lost. A mother, grandmother, and great-grandmother – a Republican – who prided herself on cooking amazing holiday dinners for her family decided to go and get to know a Democratic Congresswoman who had impressed her. A pastor, known for his work in clothing and feeding the needy within the community, had decided to stop and ask one or two questions before going to breakfast with his wife. A nine-year-old little girl, recently elected to her student council, wanted to meet her congresswoman and learn more about how democracy and our nation works. By now, we all know what happened next. A few seconds and an empty 30-round clip later, the blood of our neighbors and the lifeblood of our country ran in the streets of a previously quiet Western town. In the following days, I’ve listened as people have mourned the loss of lives… grieved the pain of the wounded… and wondered where to lay the blame. And I’ve listened as the conversation has turned to examine the tenor and tone of the political discourse within our nation. And I’ve heard people become increasingly defensive about this violence being the act of a heinous and unbalanced individual. But is this really the point? Deserved or not, this moment in our national history has brought us – albeit kicking and screaming – back to the doorstep of civility and respect. It’s brought into focus the fact that our words fall on the ears of the healthy and the fragile, the balanced and the unhinged. And our words have power. Power to unite and power to divide. Power to heal and power to wound. Power to inspire and power to disillusion. The fact that our nation is finally having this conversation for any reason is nothing short of a miracle. No less so than Congresswoman Giffords opening her eyes for the first time since her shooting. If she can open her eyes after experiencing such reckless hate, surely we can do the same.